Parus fasciatus Gambel, 1845, Monterey, California. 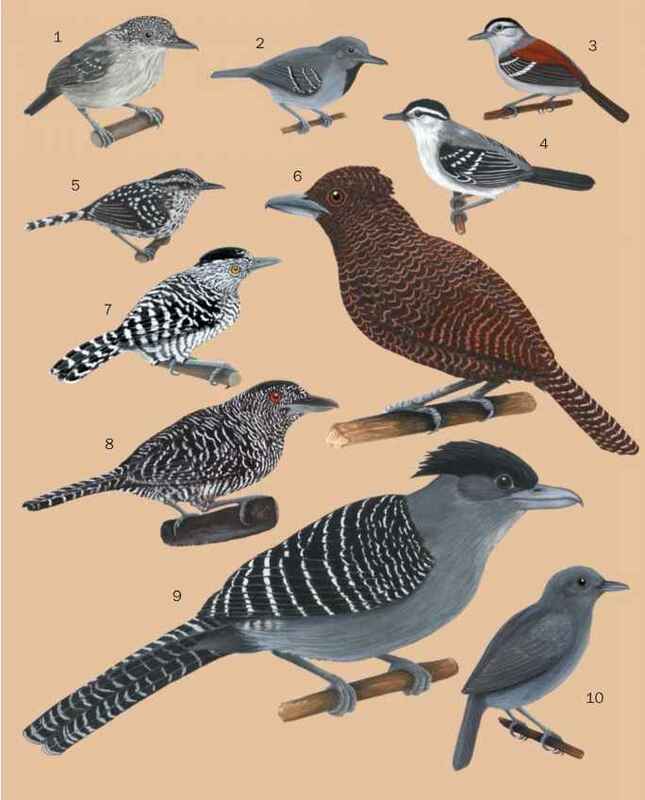 Six subspecies. While Delacour long ago considered this species a babbler, many authorities have persisted in assigning it its own family or subfamily. However, the DNA hybridization research of Sibley and Ahlquist suggests the wrentit is the only New World babbler, whose ancestors crossed the Bering land bridge in the mid-Miocene (15-20 million years ago). Sibley and Ahlquist do place it in its own tribe, Chamaeini. French: Cama brune; German: Chaparraltimalie. 6.3 in (16 cm); 0.5 oz (14 g). Gray (southern) or brown (northern) compact bird with long tail (usually held up), pale eyes, and small, sharp bill. Song is a very distinctive accelerating series of high notes. Pacific Coast of North America, from northern Oregon to northern Baja California. Generally live in pairs, communicating continuously with unique calls. Frequents heavy low vegetation. Forages for insects and berries in undergrowth. Monogamous, paired for life. Sexes share in all aspects of nesting and chick rearing. Nest is located deep in bushes, a tightly woven cup of twigs, bark, and feathers, lined with spider webs. Three to five greenish blue, unpatterned eggs compose clutch. Not threatened, though significant portions of range have been developed.